After breaking up with his girlfriend, moving out of his house, and joining a 12-step program for addiction, Ebert began work on a story about a messianic figure named Edward Sharpe. According to Ebert, Sharpe "was sent down to Earth to kinda heal and save mankind ... but he kept getting distracted by girls and falling in love." Ebert later met singer Jade Castrinos in Los Angeles. 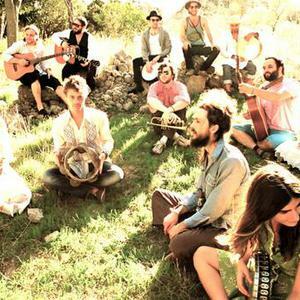 In the summer of 2009, as Edward Sharpe & the Magnetic Zeros, Ebert and Castrinos toured the country with a group of fellow musicians in a big white school bus. Its song "Home" was voted number 15 on the Australian Triple J Hottest 100's 2009 countdown, the largest music poll in the world.